One of the great things about buying a fourty year old recreational vehicle is the appliances which have sat outside, in the leaky vehicle, for just as long. Also wasps. Sometimes a little preparation cuts down an awful lot of perspiration. The Woodsman came with a large frame-mounted tank that is in reasonable shape. But it is also winter outside. With a steak-saver propane bottle-to-grill adapter and a handy-dandy one pound propane bottle, I can carry the propane to the appliances. A gravity furnace is effictively a big upside-down bucket full of fire with a vent out the back. The heat travels up on the way to the exhaust, which heats the bucket. The cold air outside then warms, rising due to gravity, clearing the way for more cold air. An alternative to this is a forced-air furnace like in central-air homes. 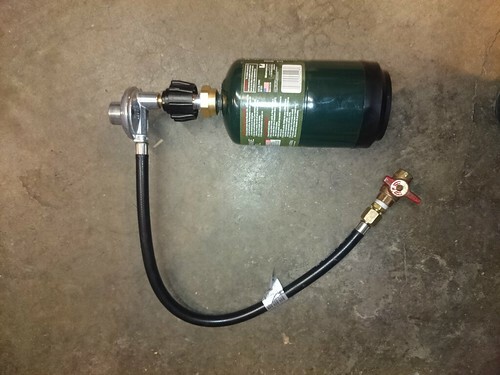 This was the easiest to get running - with a one pound portable bottle and a regulator, a little cleaning of the propane inlet, breaking the pilot light window free of rust, and it runs. After this photo, I later enameled some outer surfaces black. Also shook a few ancient wasp nests out of the exhaust. The Woodsman came with a Trav'ler propane oven and stove. 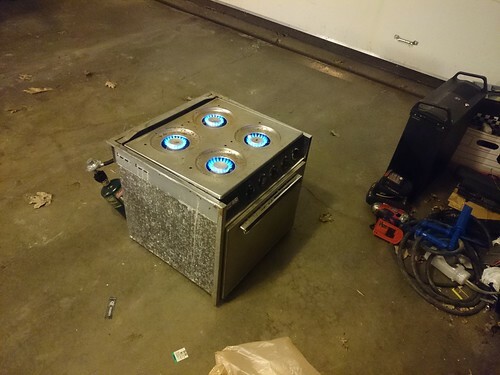 I originally planned to replace it with a larger table and space for my coleman stove. After a little brushing, the jets opened up and are working nicely. The jets are not as adjustable as my coleman and definitely lower heat output. I am currently refinishing the top surface. 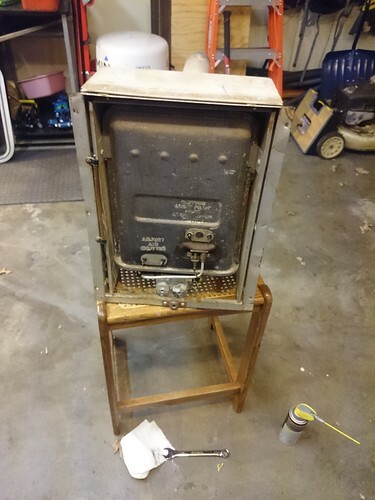 I may look into replacing the controls, but the current design involes a large manifold that connects the oven and the four burner knobs. 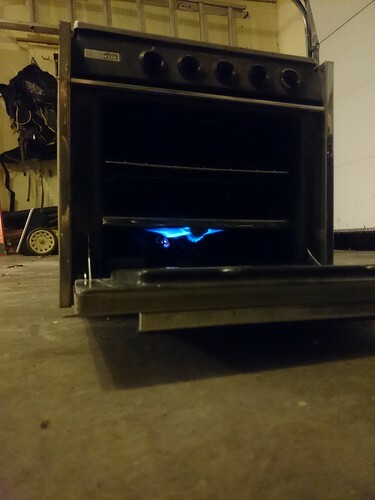 I might also look into replacing the burners themselves if it is possible to connect the coleman burners. The only tricky part here was the arcane lighting procedure, which involes running the right rear burner for a few seconds before starting the rest of the pilot lighting process. 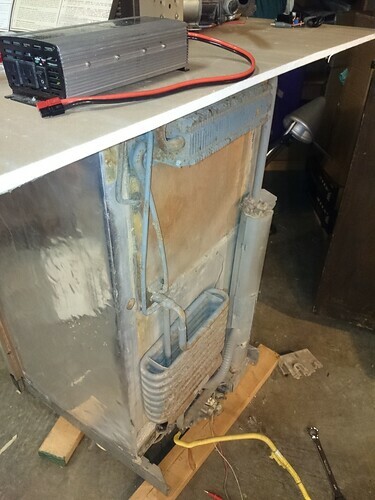 Forced air furnaces use a heat exchanger, which is a metal unit similar to a double-ended heatsink, to transfer heat from the propane fires to the interior. 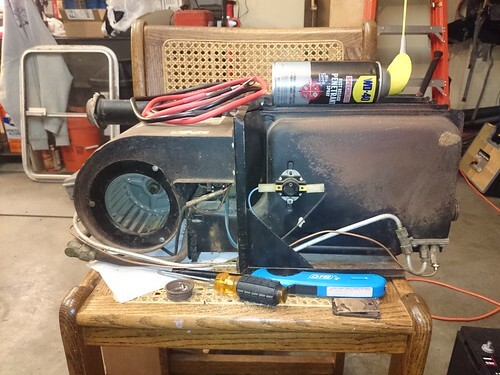 Interior air is driven across the exchanger by a blower motor. This guy is a work in progress. There are several mud dauber nests in the exchanger itself, which mostly consists of small passages. Also it is quite common for the heat exchanger to develop a leak and fail prematurely, so the next step for this guy is a pressure test, assuming I can get to the blower interface to block it off. The pilot did fire up nicely, but quickly consumed all air in the exchanger and extinguished itself, so I suspect another possible blockage elsewhere. 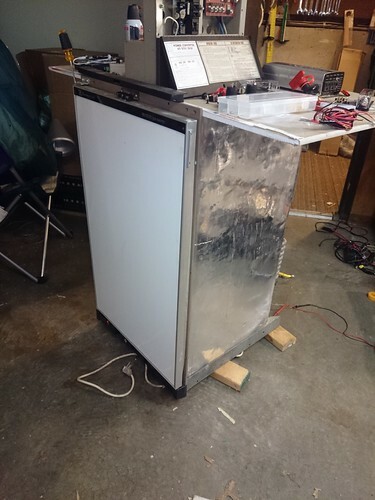 An addition I plan to make to the Woodsman is a propane-powered refrigerator. This is the next propane-powered project. This one was spotted while on a Mercedes-parts harvesting trip with a friend to Muncie Salvage. For $25, I can learn all I want about the control systems behind these, although I must be careful not to breach the coolant system, which surely is full of volatile death-ahol.